Gold price is falling continuously is it good time to buy gold? Well it is very difficult to answer this question but experts says that gold price fall likely to continue in 2014. From last few month stock market is continuously reaching new height and gold price is continuously falling. Once upon a time gold price was near by 35,000 Rs/- per 10 gm but today gold is being sold at 26,000 Rs/- per 10 gm. 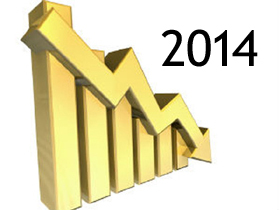 Why gold price fall is likely to continue in 2014? (1) Stock Market:- It is observed that gold market and stock market always work in opposite order. If gold price is increasing stock market is falling and vice versa. Currently market is going through similar phase. Formation of new stable government under leadership of Narendra Modi is prime reason behind recent rally in stock market. Everyone is expecting that new government will take sensible step to boost economy. (2) Dollar Value:- Recent fall in dollar value is another reason behind fall in gold price. Earlier dollar was trading in range of 64 Rs/- to 60 Rs/- and now recent dollar value is 59 Rs/-. This small change in dollar value is making big difference in price of gold. With reduction in dollar price we need to pay less money while we import gold and thus gold price reduction will take place. (3) Import & Custom Duty:- It is expected that import duty on gold will be abolished by new government in forthcoming budget. It is also expected that custom duty on gold will be reduce in forthcoming budget. This clearly means that gold price is likely to fall in local market. (4) Gold Demand:- If we talk about India, season of festival and marriage is nearly over and for next few months gold demand is likely to remain sluggish. Due to this sluggish demand gold price is likely to remain in pressure. (5) International Gold price:- Gold price is falling in overseas market. Gold price quoted USD 1,243 an ounce last. This price is close to 4 month low price of gold. Overall price reduction in international market is another reason for price fall in local market. (6) US Economy:- In the short term, the U.S. recovery regaining momentum. Recent data of employment and growth is positive. Boost in US economy will cause gold price to reduce further. In current condition it is not advisable to trade in gold. You should avoid any fresh gold purchase. Time for booking profit is also gone. Gold price is likely to fall further but our advice is you should now adopt wait and watch strategy in gold. Why Gold Rate in Indian cities are different? Gold price is falling – Good time to buy?